In the neonates, tracheal atresia and tracheoesophageal fistula (TEF) surgery may result in hemodynamic instabilization, leading to cerebral perfusion insufficiency due to the retraction of the pulmonary vessels and truncus brachiocephalicus. We represented one male and one female neonates which were performed thoracoscopic primary repair of TEF through right thoracotomy at the 3th and 4th postpartum day. Anesthesia was induced using sodium thiopental (5 mg/kg), fentanyl 4 mcg, and rocuronium (0.5 mg/kg) given through intravenous route. Sevoflurane 2% and 50% O2in air were used for the maintenance therapy. During the right lung compression to expose posterior esophagus, no value was observed on the pulse oximeter (PO) probe placed on the right hand, and radial artery was not palpated. At the same time, oxygen saturation was observed as 96%–97% on the left foot probe. As the right cerebral oximeter values (rSO2) were rapidly decreased to 31%, the lung compression was ceased. 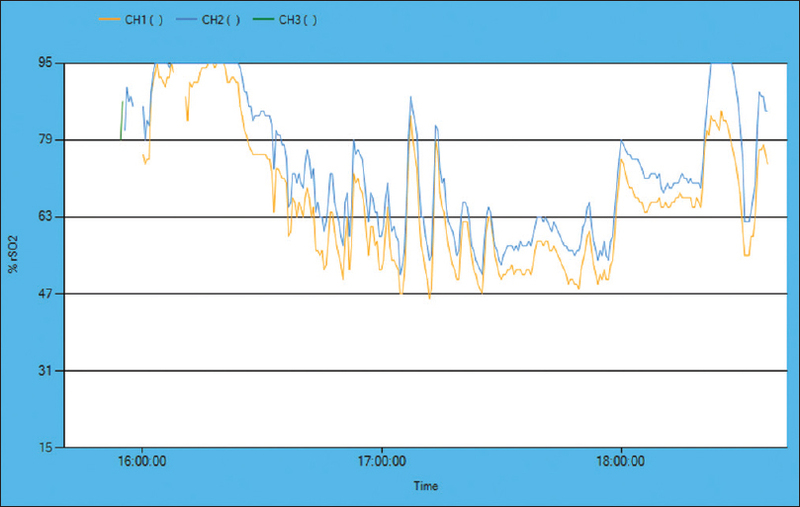 Right pulse oximeter and right rSO2measurements return to the baseline levels. For the second case - different from the first case -both left and right rSO2was rapidly decreased to 40% levels and return to the baseline levels after was removed the retractors. 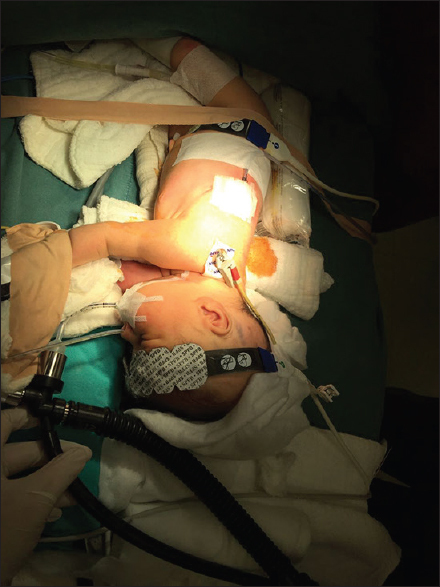 Right PO and right and left cerebral rSO2values returned to baseline immediately when the retractor compression was ended During the operations involving the great vessels in neonates, cerebral perfusion could be preserved using cerebral oximeter. Cerebral oximeter is more efficient than pulse oximeter for detecting cerebral tissue oxygenation and could be helpful to minimize neuronal damage in the neonates. Esophageal atresia has an incidence of 1:3000–5000 births. In 85%, a tracheoesophageal fistula is present. As a result of the operations that will be done within the 1st day of the life to prevent the eventual complications, the survival rates may reach 98.5%, also depending to the severity of the additional congenital anomalies., In the literature, no publication was seen about the neurologic sequelae that may occur following these operations. In our case, we aimed to present our experience about cerebral perfusion disorders that may develop as a result of compression or hemodynamic instability and cerebral oximetry, which is one of the additional monitoring methods that may be used for early diagnosis and prevention. We presented two patients to power our suggestions with the same kind of anesthetic and surgical procedure in this report. A male neonate, with 36 weeks of gestational age and body weight of 3150 g, was delivered with recurrent cesarean section and he was meconium stained after a full-term pregnancy. He was normal during the pregnancy follow-up visits. Her mother was “gravida 2, para 0.” At the birth, Apgar score was 9 at the 1st min and 10 at the 5th min. It was observed that the breathing rate was 70–80 breathes/min, accessory respiratory muscles contributed to the respiration, the patient had tachypnea, a plenty of clean and mucoid foamy secretion was continuously coming from the mouth, and the epiglottis was edematous and hyperemic. As the fact that the feeding probe placed to the stomach was not going forward was also seen in the direct abdominal graphy at standing position, in the 1st day of the birth, the patient was referred from the state hospital to the paediatric ward of our center in the spontaneous respiration and extubated with oxygen support by 25% FiO2 given through hood due to the prediagnosis of esophageal atresia. The general state of the patient was moderate, he was tended to sleep, mobile, and tachypneic (60–80 breathes/min), and Monroe, grasping, sucking, searching, and stepping reflex were present. SpO2 value ranged between 90% and 100%, the heart rhythms were rhythmic, noninvasive blood pressure was 73/46 mmHg, and the glucose level was 72–95 mg/dL. His body temperature was measured as 36.1°C. There was no external structural anomaly, except hypospadias. A complete abdominal ultrasound (US) did not show any additional pathology. Urine and stool outputs were present. 10% dextrose at a dose of 70 ml/kg was initiated. The drainage was done using feeding probe. The patient underwent direct abdominal graphy in standing position after giving a radiopaque contrast agent at day 2. In the graphy, it was observed that nasogastric probe had not passed to the stomach. In the echocardiographic examination, except the patent foramen ovale, no congenital cardiac anomaly was detected. Laboratory investigation results were as follows: glucose, 120 mg/dL; urea, 12.1 mg/dL; blood urea nitrogen, 5.7 mg/dL; creatinine, 0.79 mg/dL; aspartate aminotransferase, 65.3 U/mL; alanine aminotransferase, 7.1 U/mL; sodium, 132 mEq/L; potassium, 5.05 mEq/L; chlorine, 104.7 mEq/L; calcium, 8.89 mg/dL; hemoglobin, 16.9 g/dL; hematocrit, 49.6%; thrombocyte, 219,000 uL; and leukocyte, 21800 uL. The patient received 30% FiO2 respiratory support through hood respirator during the spontaneous respiration. In her blood gas sampling, pH was 7.34, pO2 was 50 mmHg, pCo2 was 35.8 mmHg, sO2 was 91.3%, HCO3 was 20 mmol/L, and Base excesswas −5.6. The patient, who was considered as Category A according to Waterston classification and as “Eusophagial atresia with distal tracheoesophageal fistula (TEF) 86% (gross C/Vogt IIIb)” according to anatomic classification by the department of paediatric surgery, was taken into operation. The patient was evaluated for ASA-3 status. Before the induction of anesthesia, the patient had 3-lead electrocardiography and his values were monitored through peripheral saturation probes attached to his right hand and left foot's toe. [Figure 1]. To measure brain tissue oxygenation, paediatric cerebral oximeter probes (Invos Somanetic Cerebral/Somatic Oximeter, Covidien, USA) were placed on both frontal lobes. Before the induction of anesthesia, baseline cerebral oximeter values were determined as 73% and 69% for the left and right lobes, respectively. Intravenous (IV) access was ensured using 26-gauge and 24-gauge IV cannula. For the induction, 24 mg pental sodium, 1.5 mg rocuronium, 4 mcg fentanyl were given through IV route. The patient was intubated at once with No. 3 cuffless endotracheal tube. For the maintenance therapy, 2% volume sevoflurane and a total of 10 mg fentanyl were given during the operation. First, the levels of fistula were verified using bronchoscopy. The neonates were carefully positioned and supported in a semi-prone position [Figure 1]. Their right side was elevated and their right arm was placed above their head. After the positioning, pleural space was reached through the right 4th intercostal spaces. Vena azygos and vagus nerve were visualized. Proximal esophagus was localized using nasogastric tube. During this surgical procedure, a retractor was placed on the right lung to reach the posterior part of the esophagus and to ensure the visualization. During the retraction, it was seen that the pulse oximeter probe placed on the right hand did not show any value, the radial pulses of the right hand could not be obtained, the oximeter probe placed on the toe of the left foot showed a value of 96%–99% with pulse waves, and cerebral oximeter values of the right hemisphere decreased up to 31% within few minutes. Therefore, the presence of compression on the truncus brachiocephalicus was considered, and the operation was interrupted. Meanwhile, it was observed that the pupils were nonisochoric and that the diameter of the right pupil was 3 mm whereas that of the left pupil was 1 mm. 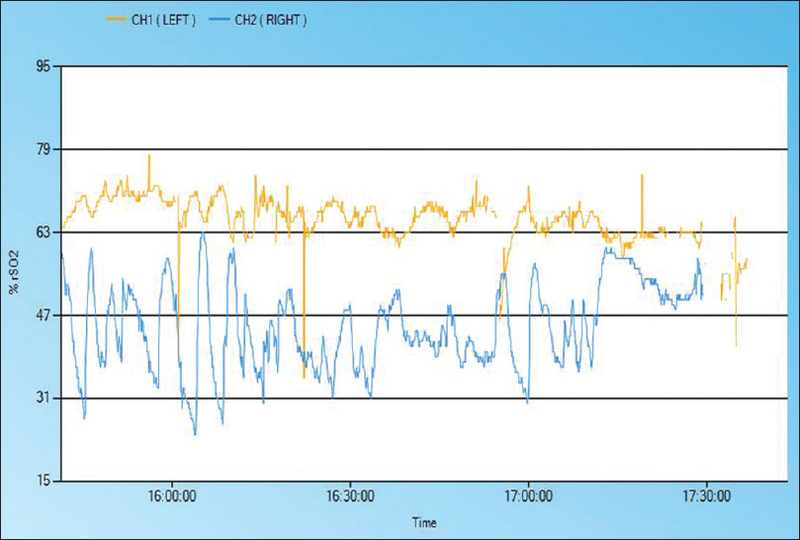 It was seen that, on the removal of the compression, the values of the oximeter placed on the left hand were reinitiated to be measured and the right cerebral oximeter (rSO2) values of the right frontal hemisphere approached the baseline values. The fistula tract, which was adjacent with the trachea in its distal, was ligated using silk by its connecting point to the trachea, sutured, and excised. Distal esophagus was released, it was made suitable for the end-to-end primary anastomosis, and then, the primary anastomosis was completed. A 12 Fr chest tube was placed to the posterior mediastinum through the right 5th intercostal space in the patient who was laid down in the position of right thoracotomy. Chest tube was fixed on the skin and closed water-seal drainage was performed. The layers were closed in the anatomic plane. During the operation, the retraction was intermittently ceased based on the cerebral oximeter values to allow the rSO2 values to approach to baseline values, and thereby, the operation was completed [Figure 2]. Blood loss <10 ml was documented throughout the operation. Fluid replacement consisted of 100 ml/kg/24 h as a crystalloid solution. On the completion of the operation, the patient, being intubated and mechanically ventilated and receiving assisted respiration, was transferred to the neonatal intensive care unit. During the operation, the body temperature of the patient was tried to be maintained at 30°C using external heaters, with the control ensured by the measurements done using the skin temperature probes placed on the back of the patient. At the end of the operation, the blood glucose was 189 mg/dL. Pupils were observed to be isochoric (1 mm/1 mm). On the termination of the anesthesia, 0.25 mg atropine and 0.2 mg neostigmine were administered. As the patient had no spontaneous respiration, he was bradycardic (110 beats/min), his sucking, searching, grasping, stepping, and Monroe reflexes were weak, he had moderate hypotonia, and he was transferred to neonatal intensive care unit being intubated and assisted by mechanic ventilation in the postoperative period. In the blood sampling done in the absence of spontaneous respiration, with the mechanical ventilator support and with the oxygen support at FiO2 30% given through hood, pH was 7.40, pO2 was 83.1 mmHg, pCO2 was 29.5 mmHg, sO2 was 98.7%, HCO3 was 20.5 mmol/L, and BE was − 5.9. During the monitoring in the intensive care unit, FiO2 was 30% and SpO2 was 94%. Postoperative urine output was 0.9 ml/kg/h. As the patient had the reflexes activated and a normalized tonus at postoperative 1st h, he had spontaneous respiration at postoperative 9th h, his reflexes were active, he was normotonic and no pathological or neurological abnormality was detected in his physical examination, and he was extubated and initiated to be followed up in the spontaneous respiration. He began to receive total parenteral nutrition. Ampicillin, amikacin, and cefotaxime were initiated. At postoperative 2nd day, lung atelectasis occurred. Following the deep tracheal aspiration, it was seen that atelectatic area was partially open. In the examination of the transfontanel US done at postoperative 3rd day, both brain hemispheres and parenchymas were normal, 3rd, 4th, and lateral ventricles and basal ganglions had a normal appearance, and the cerebellum appeared to be normal. Again, the blood sampling done at postoperative 3rd day resulted to T4 = 1.33 ng/dL and thyrotropin (TSH) = 23.58 mcIU/mL. The patient initiated to be given thyroid hormone. Due to the hyperbilirubinemia, phototherapy was initiated. At postoperative 13th day, free T4 was 1.57 ng/dL, free T3 was 4.72 pg/mL, and TSH was 2.79 mcIU/mL. Due to high fever, at postoperative 5th day, cefotaxime was discontinued and the antibiotic therapy was maintained with 1 × 75 mg/day amikacin, 2 × 29.4 mg/day vancomycin, and 3 × 170 mg/day tazobactam. At postoperative 10th day, the discharge from the chest tube suggested the likelihood of a leakage, and therefore, orogastric probe-assisted feeding was stopped. At postoperative 15th day, in the follow-up visits of the patient who was monitored and treated in the neonatal intensive care unit, it was seen that he had tachypnea and the accessory respiratory muscles contributed to the respiration. The follow-up and treatment of the patient were continued in the neonatal intensive care unit due to the presence of recurrent pulmonary infections and he was discharged at the end of 2 months. On the 7th month, the child has not got any neurologic disorder. A female neonate, with 40 weeks of gestational age and body weight of 3650 g, was delivered with cesarean section. Apgar score was 9–10. The feeding probe placed to the stomach was not going forward unless 9 cm was also seen in the direct abdominal graphy with barium at standing position, in the 1st day of the birth. Esophageal atresia was seen in the graphy. She had spontaneous ventilation 46 breath/min and 140 beat/min heart rate. Physical examination was normal except of esophageal atresia and accessory respiratory muscles contributed to the respiration. Thoracoscopic primary repair of TEF through right thoracotomy was planned at the 4th postpartum day. Anesthetic management was done with same procedure as the first case. Initial oxygen saturation was observed as 91%–95% on the left foot probe. Cerebral oximeter values were 95% left and 91% initially. The difference from the first case both left and rSO2 was rapidly decreased to 40% at the same time during the lung compression through retractor. Right pulse oximeter and right and left cerebral rSO2 values returned to baseline immediately when the retractor compression was ended [Figure 3]. Operation time was 125 min and the patient was intubated and transferred to the neonatal intensive care unit. She was discharged from hospital on the 11th postoperative day without any complication. Major operations undergone during the neonatal period may result to several neurological damages. These damages may include many neurological abnormalities ranging from severe central nervous system sequelae such as stroke and seizures to attention and affect problems, learning disabilities, and high-level integration difficulties., Open esophageal atresia and TEF repair operations may lead to the complications such as strictures, gastroesophageal reflux, anastomotic leakage, and recurrent fistulae. Again, in these patients, concurrent congenital cardiac anomalies are commonly encountered. For the diagnosis of congenital heart disease, all patients should undergo electrocardiogram and echocardiogram in the preoperative period. Furthermore, congestive heart failure should be medically optimized in the preoperative period. In our case, no congenital cardiac anomaly other than ventricular septal defect was detected. The patient had no cardiac failure. Pulmonary failure is an important factor to be considered when administering an anesthetic. The occurrence of a quite complicated condition in terms of the administration of anesthesia is inevitable, with accompanying presentation of pneumonia resulting from the delayed diagnosis of the fistula due to low lung compliance and increased gastric distension. Anesthetic and surgical procedures were focused to ventilate the lungs without ventilating the fistula. The problems that an anesthetist can encounter during the operation include endotracheal tube obstruction and the complications related to large carinal located fistulae that may occur during the preoperative rigid bronchoscopy, in addition to gastric distention. Especially in the tracheal atresia operations, the small size of incision area in the surgically intervened region leads to an environment quite vulnerable to the complications due to its proximity to main vascular structures. In a case report published in the literature, first, the area to be operated was visualized using rigid bronchoscopy, and thereafter, fistula ligation was done using thoracotomy and the gastrostomy was performed. In this case, hemodynamic instability due to the right lung compression developed, and as a result, the patient had to receive short-term adrenaline infusion. In our case, the blood pressure was measured using a noninvasive sphygmomanometer cuff attached to the left arm. The measurements were about 75/30 mmHg and no hypotensive attack was detected. Oximeter probe attached the toe of the left foot yielded a value of at least 94% during the course of the operation. However, the correlation between the values obtained from another oximeter probe located in the right upper extremity, and right cerebral oximeter values were strongly significant and alerting. As also seen in our case, during the EA/TEF operations, compression-related changes can occur in the pulmonary and systemic circulations. It was observed that in this stage, the use of cerebral oximeter was an important guide in the prediction of the brain blood flow changes that may result from the compression. Cerebral oximeter/tissue oximeter devices that utilize near-infrared spectroscopy technique are optical monitors that show noninvasive regional cerebral oxygen saturation. Their areas of use become incrementally more numerous. In the clinical studies performed, it was reported that following paediatric postoperative cardiac operations (bidirectional Glenn and Fontan), cerebral oximeter rSO2 values were deemed as a clearer indicator compared to mixed venous oxygen saturation (SvO2). In the literature, a comparative study between cerebral oximeter and pulse oximeter values to determine the range of cerebral oximeter values within the first 72 h in the premature, asphyctic, and healthy newborn groups demonstrated that mean cerebral oximeter values and mean pulse oximeter values were 76.85% + 14.1% and 91.86% + 5.9% in the asphyctic group, 79.08% + 9.04% and 92.01% + 5.3% in the premature group, and 77.56% + 7.6% and 92.82% + 3.8% in the control group, respectively. In our case, baseline values obtained by cerebral oximeter were 73/69% in the left/right hemisphere, whereas baseline values obtained with the pulse oximeter placed on the left foot's toe were 96%–99%. The brain is highly vulnerable to ischemic damage due to its high level of oxygen consumption and its dependence to aerobic glucose metabolism. Prolonged decrease of blood flow leads to a dysfunction of the brain. Irreversible neuron damage occurs within 3–8 min. In our case, the operation was interrupted for short intervals with the guidance of cerebral oximeter probe; the operation was resumed upon the observation that oximeter values in the right hemisphere approached to baseline values, and cerebral perfusion impairment resulting from the compression on the right lung and indirectly on the truncus was tried to be minimized. Clark DC. Esophageal atresia and tracheoesophageal fistula. Am Fam Physician 1999;59:910-6, 919-20. Morgan GE, Mikhail MS, Murray MJ. Paediatric Anesthesia: Clinical Anesthesiology, 4th ed. United States: McGraw- Hill Companies; 2006. p. 941. Broemling N, Campbell F. Anesthetic management of congenital tracheoesophageal fistula. Paediatr Anaesth 2011;21:1092-9. Mahle WT. Neurologic and cognitive outcomes in children with congenital heart disease. Curr Opin Pediatr 2001;13:482-6. Wernovsky G, Shillingford AJ, Gaynor JW. Central nervous system outcomes in children with complex congenital heart disease. Curr Opin Cardiol 2005;20:94-9. Konkin DE, O'hali WA, Webber EM, Blair GK. Outcomes in esophageal atresia and tracheoesophageal fistula. J Pediatr Surg 2003;38:1726-9. Gayle JA, Gómez SL, Baluch A, Fox C, Lock S, Kaye A, et al. Anesthetic considerations for the neonate with tracheoesophageal fistula. Middle East J Anaesthesiol 2008;19:1241-54. Saade E, Setzer N. Anesthetic management of tracheoesophageal fistula repair in a newborn with hypoplastic left heart syndrome. Paediatr Anaesth 2006;16:588-90. Tortoriello TA, Stayer SA, Mott AR, McKenzie ED, Fraser CD, Andropoulos DB, et al. Anoninvasive estimation of mixed venous oxygen saturation using near-infrared spectroscopy by cerebral oximetry in paediatric cardiac surgery patients. Paediatr Anaesth 2005;15:495-503. Kaya A, Okur M, Sal E, Peker E, Köstü M, Tuncer O, et al. Comparison of cerebral oximeter and pulse oximeter values in the first 72 hours in premature, asphyctic and healthy newborns. West Indian Med J 2014;63:698-702. Yörükoǧlu D. Brain protection: Review. Turk Klinikleri J Anest Reanim 2008;1:8-14.